Q: Does Apple Music work on Kindle Fire? I just got the free 3 month trial of Apple Music. I own an iPad, have iTunes on my HP computer and own 2 Kindles. I haven't been able to load the app on the Kindles, does Apple Music even work on a Kindle? Question asked on Apple Communities. The Fire Tablet, formerly called the Kindle Fire, is a tablet computer developed by Amazon.com. It is the best tablet in its price range. 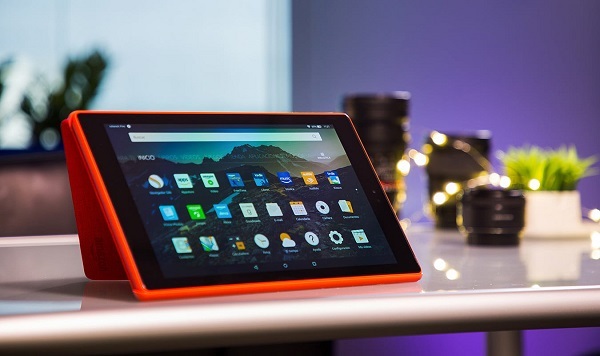 It runs a user-friendly operating system called Fire OS, which is based on Android but can't natively access the Google Play store, and offers easy access to Amazon's vast media library. The Fire also includes a microSD expansion slot so you can add storage on your own up to 128GB. Why Apple Music Doesn't Work on Kindle Fire? 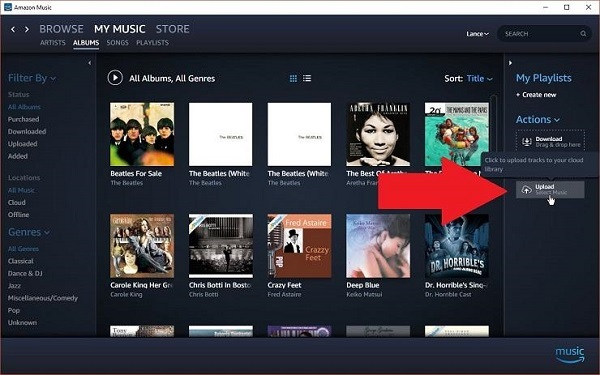 When it comes to listening to streaming music on your Amazon Fire, most of us will think of Amazon Music. Since Amazon Music is the own service of Amazon. Amazon Prime members can easily stream music from Amazon for listening offline on Fire. As for Apple Music, things get more complicated: you will find Apple Music is not available on Amazon Fire. That's because there is no version of iTunes for Kindle Fire, and version of Apple Music app available from the Google Play Store doesn't yet work on Amazon Fire tablets. In addition, the Fire supports audio formats including non-DRM AAC, MP3, MIDI, PCM/WAVE, OGG, WAV, etc. But the songs you downloaded from Apple Music are protected by DRM. Obviously, Apple Music songs are not supported by Amazon Fire tablets. So is there a simple yet professional way to stream Apple Music to Amazon Fire for Apple Music members? Yes, you can just convert Apple Music tracks to the Fire supported audio formats, like MP3. 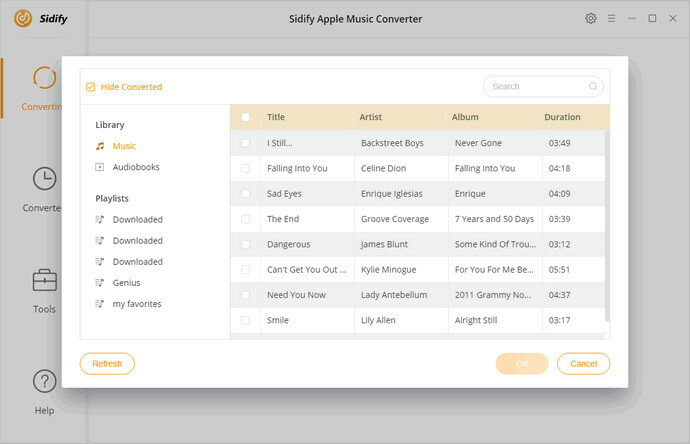 So you will need a professional and powerful Apple Music DRM Removal Software such as Sidify Apple Music Converter. It is specially designed to remove DRM protection from Apple Music and convert Apple Music files to Amazon Fire supported audio formats, like MP3, AAC, WAV and FLAC. Therefore, you can sync any music from your Apple Music to Fire Tablet at will. Completely bypass DRM from Apple Music songs, iTunes purchased music and audiobooks. 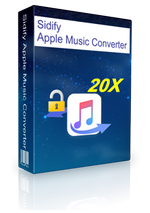 Convert Apple Music songs to MP3, AAC, FLAC or WAV with lossless quality kept. Stream Apple Music to Amazon Fire, Google Tablets, iPod, PS4, etc. Fully compatible with latest iTunes & Windows 10 & macOS 10.14 Mojave. 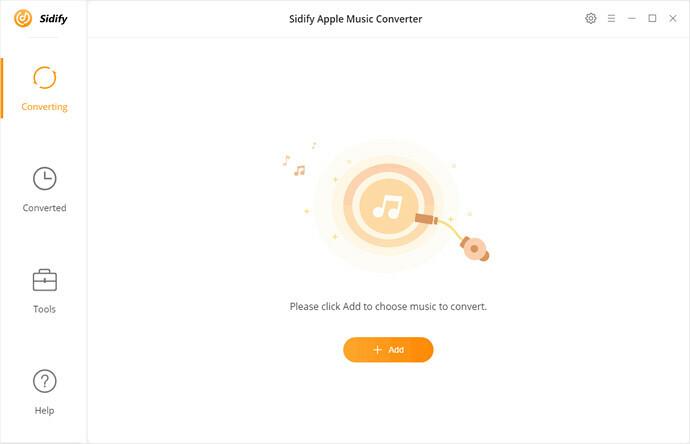 Download and install the latest Sidify Apple Music Converter on your Mac or PC. When you open the program, you will see the simple and intuitive user interface. 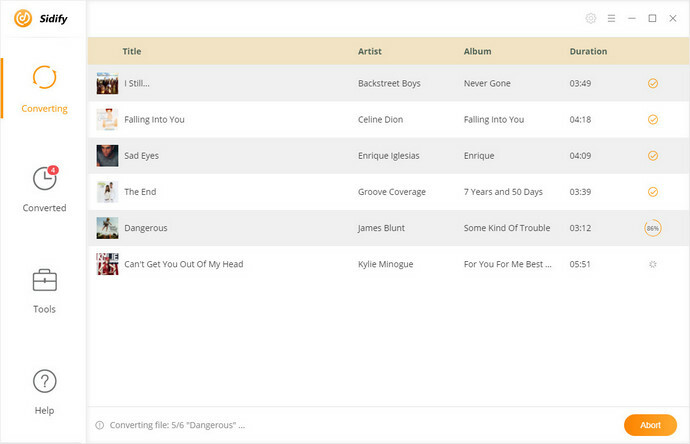 You can click + button to select songs you want to convert from the pop-up iTunes library window. Before started, please make sure you have downloaded the Apple Music songs on your computer. Then hit OK.
You can click Settings button on the top right of main window to set the output format. Because the best audio format for playback on Amazon Fire Tablet is MP3. Here you can choose MP3 as the output format. You can also set the output quality and output path as you need. 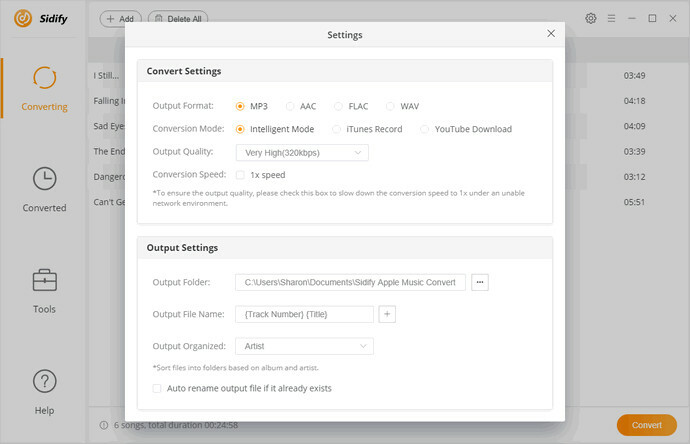 After all the settings, click Convert button to start to remove DRM from Apple Music songs and convert them to MP3. When the conversion completed, you can find the DRM-free Apple Music files on the history option. There are two ways to stream Apple Music songs to Amazon Fire. On the one hand, you can transfer the converted Apple Music to Amazon Fire via USB. On the other hand, you can add your DRM-free Apple Music collection to My Music with your Amazon account. All in all, with Sidify Apple Music Converter, you are capable of streaming any Apple Music songs to your Amazon Fire Tablet for playback without any limits.